Oil filters are an often overlooked car component, but our own David Tracy has established that they can actually be quite interesting. One thing you may not know is that when an oil filter is just dumped in a trashcan in the Wegman’s parking lot, it will probably just end up in a landfill somewhere. Here’s a strong case for making sure you recycle them instead. But what happens if they are recycled instead? 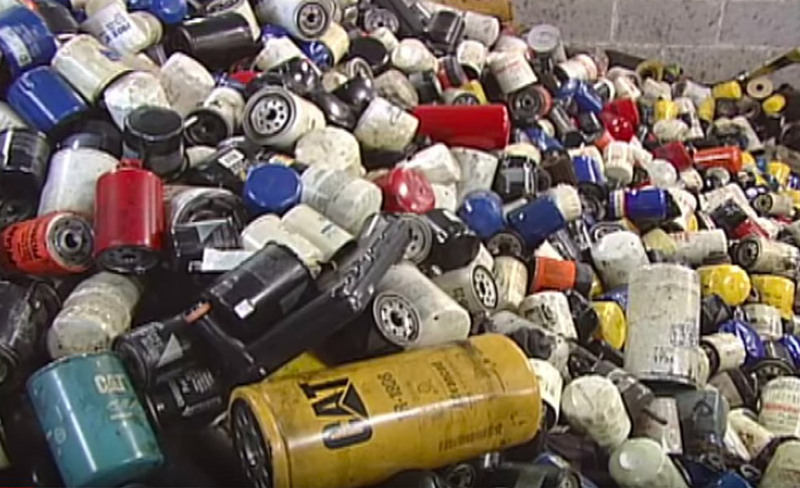 In this video by Lucas Lane Inc. in Bernville, Pennsylvania, they illustrate the whole process of recycling an oil filter. According to their statistics, of the more than 500 million oil filters currently in use, 75,000 tons of scrap steel gets wasted along with over 9 million gallons of waste oil. That steel can be used to make all manner of useful products (like cars) and the waste oil gets used to make asphalt for new roads. You are actively making your driving future better by recycling. First, the oil filters are collected. This varies in every recycling company, but Lucas Lane collects used filters in 55 gallon oil drums they provide to car dealerships, mechanic shops, and whatever other place would dispose of oil filters. This is where some of the excess oil is collected. Next, the filters are compressed into neat little cubes to squeeze out the last little bit of oil. Even after being crushed into a square, there’s still a bit of excess oil. That’s where they bring out the heat. Finally, the now cubed filters are brought into a large oven, known as a thermal processing machine, where they are heated to 1,300 degrees where all the oil is forced out into collection receptacles at the bottom of the processor. A secondary chamber heats up to well over 1,700 degrees to burn off any excess vapors or fumes. This final stage of the process can get over 700 gallons of used oil. This leaves little cubes of now oil-less steel that can be used for all manner of manufacturing and used oil that can still be utilized. So the next time you tear the oil filter off you 1975 Mercury Cougar and throw it in the woods, think about recycling it instead. Bring the filter to the shop with your used motor oil and ask them to take it too.